Throughout history people have had a fascination with finding the ark of the covenant. Even Hollywood with its adventure packed blockbuster "Raiders of the Lost Ark" captivated the attention of audiences everywhere. It was an exhilarating experience to be taken on a journey with Indiana Jones on his quest for the sacred relic. But unlike the movie, where the Ark was uncovered, in real life its resting place still remains a mystery. Some believe the ark is hidden somewhere beneath the Temple Mount, in one of the rock carved tunnels that lay underneath. While others believe it was taken out of Israel and carried off to Ethiopia. Although there are many theories behind where the ark of the covenant currently resides, one thing is certain, archaeology has already proven its existence. In Jerusalem, the golden roof on the Muslim shrine of the "Dome of the Rock" towers over the site where the Jewish temple once stood. 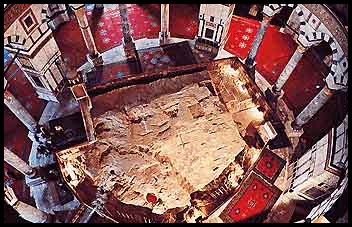 Its foundation is a massive rock on which archaeologists have laid out all the rooms of the old Jewish temple including the Holy of Holies. The Holy of Holies is the room where the ark of the covenant was kept. To this very day a rectangular depression, the same size as the ark of the covenant, can be seen marking where it once stood in the Jewish Temple. The depression measures 4'-4" x 2'-7" (2 � cubits x 1 � cubits), the exact dimensions of the Ark of the Covenant as recorded in "Exodus 25:10". And it is located right smack dab in the middle of the Holy of Holies. According to Hebrews 9:4, the two tablets of the Ten Commandments were housed in the ark along with a golden pot of manna and Aaron's rod that budded. When Jesus was crucified, the veil the separated the Holy of Holies was torn in two signifying that all people can now come freely into God�s presence. No longer is there a need to make an offering for sin, for Jesus our great high priest offered his body as the perfect sacrifice for sins, once for all. As Hebrews 9:3-15 states: "and behind the second veil, the part of the tabernacle which is called the Holiest of All, which had the golden censer and the ark of the covenant overlaid on all sides with gold, in which were the golden pot that had the manna, Aaron's rod that budded, and the tablets of the covenant; and above it were the cherubim of glory overshadowing the mercy seat. Of these things we cannot now speak in detail. But Christ came as High Priest of the good things to come, with the greater and more perfect tabernacle not made with hands, that is, not of this creation. Not with the blood of goats and calves, but with His own blood He entered the Most Holy Place once for all, having obtained eternal redemption. For if the blood of bulls and goats and the ashes of a heifer, sprinkling the unclean, sanctifies for the purifying of the flesh, how much more shall the blood of Christ, who through the eternal Spirit offered Himself without spot to God, cleanse your conscience from dead works to serve the living God? And for this reason He is the Mediator of the new covenant, by means of death, for the redemption of the transgressions under the first covenant, that those who are called may receive the promise of the eternal inheritance. Hebrews 10:18-22 says: 'Now where there is remission of these, there is no longer an offering for sin. Shall the Ark ever be found? "Then it shall come to pass, when you are multiplied and increased in the land in those days," says the LORD, "that they will say no more, 'The ark of the covenant of the LORD.' It shall not come to mind, nor shall they remember it, nor shall they visit it, nor shall it be made anymore. And Jesus cried out again with a loud voice, and yielded up His spirit. Then, behold, the veil of the temple was torn in two from top to bottom; and the earth quaked, and the rocks were split, and the graves were opened; and many bodies of the saints who had fallen asleep were raised; and coming out of the graves after His resurrection, they went into the holy city and appeared to many. This article is a chapter from our 3 volume book series "Bible Believer's Archaeology" which can be downloaded for your ebook reader or mobile device by visiting our resource download page by Clicking Here. Pg.46-55 "The Ark of the Covenant in Solomon's Temple." Pg.211-219 "Has archaeology found the place of the ark?" Artwork: Partial reproduction of 'The Israelites Crossing the Jordan' Artist: Julius Schnorr von Carolsfeld Illustrated in �Bible in Bildern� Circa 1851-1860. Artwork: Illustration of the top view looking down from the Dome of the Rock. Original Illustration was modified to show the location of the impression where the ark of the covenant rested. Original illustration taken from Scribner�s Monthly - Volume 11, December 1875 Article: �The site of Solomon�s Temple Discovered� pg.265, Author: Scribner and Company, Publisher: Francis Hart and Company. Artwork: partial reproduction of 'The Curtain of the Temple Torn' Artist: Henry Felix Emmanual Philippoteaux - Circa 1840-1880.